High Quality Content by WIKIPEDIA articles! 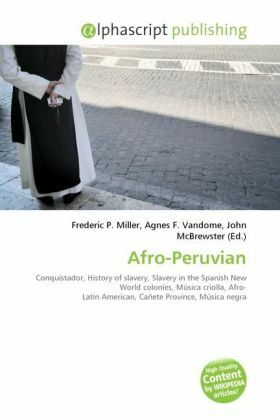 Afro Peruvians are citizens of Peru descended from African and Malagasy slaves who were brought to the New World with the arrival of the conquistadors towards the end of the slave trade. The first African Peruvians arrived with the conquistadors in 1521, to return permanently in 1525. They fought alongside the conquistadors as soldiers and worked wherever needed. Because of their previous acculturation in Spanish language and culture, they performed a variety of skilled and unskilled functions that contributed to Hispanic colonization.